Help us take London a little step closer to well-being and happiness! 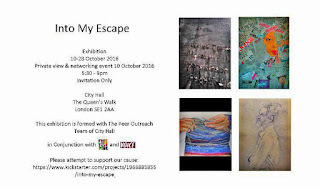 Help us make a difference by producing an art exhibition with amazing prints and foamex boards at London City Hall about Mental Health and its encounters. To provide space for discussion and give knowledge about awareness such as safeguarding initiatives on how to spot and support children in need. What mental health issues actually consist of and managing those points. Promote engagement from a larger audience and create a show which visually informs the effects of depression and the beneficial outcome of exploring artistic practice. To build a community established on well-being for young minds and develop a positive social understanding attached to the perception of depression. To give a full perception of living with depression and the joy that can be experienced even in the darkest hours which help the general public with notions of compassion and general understanding. The provision of arts help those with a variety of illnesses hold focus of perception and reality, it has been shown to help alter emotional responses. With children as young as five being diagnosed with depression something has to be done!. So we are taking the issue to those who can make a change and show the importance of artistic expression as a form of communication, self-awareness, acceptance and release. As well as creating school art programmes encouraging positive states of mind, we will be focusing on better health provision through art programmes for all ages throughout London. Help us take London a little step closer to happiness! Whilst we are experienced in meeting deadlines and producing work on request, there are always unforeseeable obstacles that may appear, Nonetheless the fund will help us to make our goals of finalising our work, preparing enough prints and flyers to promote the exhibition, also our backers are very important to us and we intend to provide art work of a high standard once our funding goal has been reached!